When I started homeschooling in 1998, I did the only thing I knew how to do: I set up a “real” classroom in our and ordered a million dollars worth of workbooks. (At least it felt that way.) And we did okay … for a while. 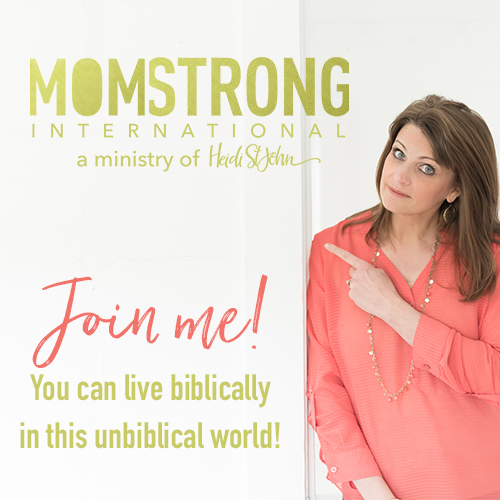 We were about six months into it when I began to notice that the “life” I had longed for was just not happening with the workbooks. For the kids, it was just “business as usual,” as we went about our school day; there was no chance for creativity outside of the prescribed worksheet. They seemed bored and disinterested. Another thing that frustrated me was that each one of my children was studying something different; the first grader and third and fifth grader were all doing a different era of history. Different sciences. Even different Bible lessons. I was frustrated. I was hoping for more “togetherness” in our studies, and less fragmented days. I didn’t miss the crazyness of taking my daughter to school every day. 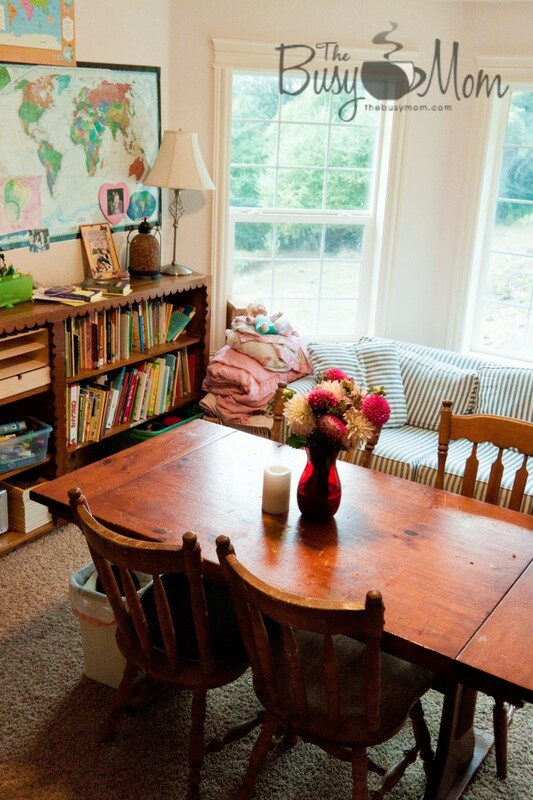 I was hoping for more of a “one room schoolhouse” approach in our homeschool, and having so many different workbooks and textbooks was not answering my heart’s cry to simplify our learning together. So, I began to search. It was 2005 when I discovered something called lapbooking. (I love lapbooking so much that I wrote an eBook on the subject.) Shortly after that, I learned about notebooking. These two things literally changed the way we homeschool. If you’re looking for a way to simplify your homeschool, keep reading. Notebooking might be just the answer you need. 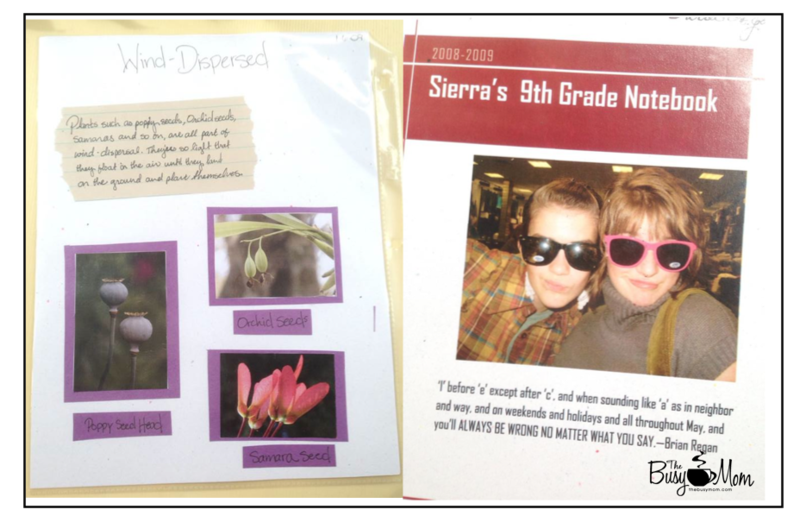 Over the years, we have done a mixture of these kinds of notebooking. I also keep a few pages here and there of traditional “workbook” pages in their notebooks. It serves as a reminder and *proof* that we’ve actually accomplished something that year. Occasionally I will open the notebooks to remind myself. What do you use? I use 2″ or 3″ binders. They can be found on sale all the time over at Amazon and of course you can find them at your local WalMart. Every family who notebooks does it a little differently. At our house, we notebook just one day each week. Usually, we do it at the end of the school week. I’ll try to break it down for you a little by putting it into steps. I let my children choose things off the list to write about based on their age. For example, the 3rd grader chooses two things that really made her eyes light up. She will make two notebook pages about those two things. The older they are, the more pages they can create. Four is about the limit for “original” pages, so if you have a high schooler, you might ask them to create a page about each of the four things I listed above. We make a mess. Messes are good when they’re signs of a creative, engaged child! Get out the cardstock, glue, scissors, sheet protectors, colored pencils and crayons. Let your children be creative. Create a page! Sometimes, I use notebooking templates that I find on the internet, or I create my own on our home computer. My favorite way by far to create pages is to simply let the children make their own. You’ll need to show them examples, and if they are young, you’ll need to help them draw lines, etc., but after that, let them spread their creative wings and fly! When notebook pages are done, put them in sheet protectors and put them in your binders. Don’t forget to put a DATE on each page! I like to keep our binders in chronological order. It really helps with reference points at the end of the year. Add other pages you are doing in school; the occasional math page or language lesson. All of these will serve to help you create a wonderful portfolio of your child’s work. They’ll love looking back over it. Use what you have around the house to create pages. The one on the right is computer made. Bottom line: Notebooking can help you be more creative with your children, learn more and enjoy it more. Give it a try! 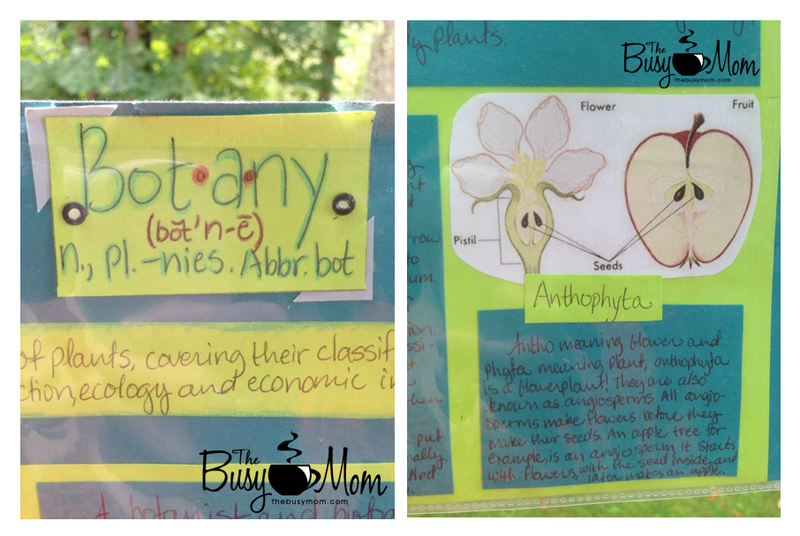 Page from a study on botany (L) and cover for our second daughter’s 9th grade notebook. Heidi – Thank you! I needed that tip. I realize that I try to do so much that we end up burning out way too soon. You’re welcome 🙂 No burning out allowed 😀 Or at least, let’s burn out together! Love this idea! I am going to try using notebooking and lapbooking. Heidi… How do you do all you do? I’m a pretty structured mom… Up early, homeschooling 5 kids and dropping the 6th off at her school for kids with special needs, making meals, taking care of the household chores (with great help from my kiddos), going back and forth to sports practices , various sports games, family outings, doctors appointments, dentist appointments, random play dates, church activities…. And my husband is self-employeed, works from home, and is a great help when I need to be in two places at one time. I strive for simplicity, quality time, and not trying to “do it all”… At least not all in a day:) I LOVE to blog. I just don’t seem to have the time lately… So my question to you is… How are you doing all that you do without burning the candle at both ends? Love this! I didn’t know this was a “style” really. I’m starting home preschool this year for my 3 and 2 yr old and plan to have them draw a page at the last school day each week for our number and letter of the week and have it in a notebook with sheet protectors. But I love the older and progressing idea! My younger son spent quite a bit of time designing his own blank notebook complete with lines for writing and boxes for drawing pictures. I will encourage home to use it for note booking. Great idea! Let me know how it goes Michelle! We did great with notebooking once a week last fall, but got thrown off course with so many things with the arrival of another baby 🙂 My daughter did a few pages in the spring/summer. We printed off the last couple pages for her notebook last weekend (some of her writing that I typed as she dictated) and it was so fun looking through the last year and seeing how her writing and drawing skills have progressed! We’re looking forward to starting another year next week. Thank you, thank you, for all of these!!!!! So helpful! Love this. I keep trying to move in this direction, but end up with the same old thing, somehow! But, this year we started out slow, without all the curriculum this week, so we could work on basic skills and make a math notebook for reference. The kids were NOT looking forward to starting school, but they are loving this! But one gripe! And, our boys keep watching math videos spontaneously AFTER our quit time! Very cool. Thank you for your encouragement in notebooking (among other things). So helpful! Heidi you have just written the blueprint of whats been going on in my heart for the past year . I recently made the hurdling leap from private school to home school. Five kids ages . various . Twins , yes . It has been a wild two and a half years ! But I was too was saddened by the sight of my kids so spread out with what they were learning I felt the vision was’t being seen . Until one day when I looked my daughter in the eye as we were reading a paragraph about . Place unknown . And I saw an emptiness in her eyes , reflecting the same emptiness I had been feeling , so we closed the book . Closed that curriculum we were currently using . And I looked up and said ” what now then God ‘ and He has led me to lapbooking , notebooking , and some of the best curriculums EVER ! Days are still exhausting , hectic ,chaotic , but at least I know we are fulfilling the vision God placed in my heart for our family .Togetherness . I never knew we were notebookers! 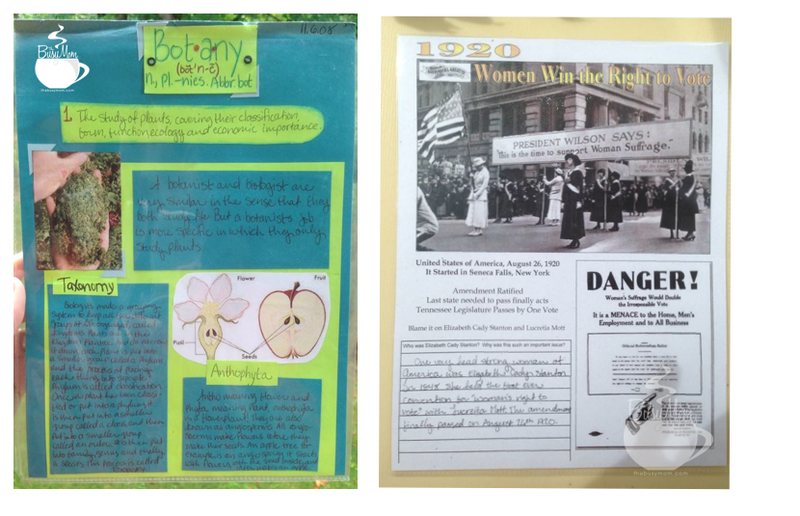 We keep history and science journals and I have the kids draw pictures and write about what they learned about. We do narration as a prime form of instruction, so I started the journals to show proof of what we do. Thanks for the resources for making it even more creative and crafty! My oldest is dyslexic and boy oh boy is the spelling rough!! lol It’s a fine line for me to have her keep pride in her work and not stressing the spirit right out of her. Using the computer is the best for her so maybe let the dyslexic children use the computer to print out their summaries. Thank you so much for this series of blog posts. I found the first very encouraging and helpful and can’t wait to read this second one. Thank you SO much for sharing! They are all so useful, as will the next post! Thanks for sharing and being real. Heidi… just got through watching a few clips on YouTube about homeschooling including “what is lap booking”….. will you put one there as well? 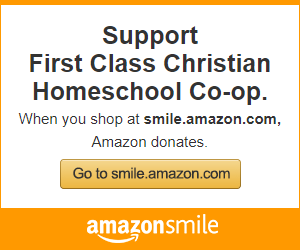 I’d love to watch it – anything that is on homeschooling from you. We pulled our son out of private school at the beginning of the year. I pulled together some things and we dug in. We were so burnt out by the end of the school year that I have spent the summer researching…there has to be a way that we can both enjoy this, that doesnt leave me screaming and crying at the end of each day. My poor husband was so frustrated that I almost got fired. So, I have a loose plan for the school year incorporating some of Charlotte Masons ideas, Wholehearted child and this idea of notebooking I love. He is a very artistic child, I think he would love this. Hello Heidi, We are new to homeschooling this year. I have started notebooking with me kiddos. I have three. We notebook on Fridays. I am curious do you let your children look back at notes and books or are they supposed to notebook from memory? The reason I started notebooking was to see that my kids were learning the lessons by notebooking them in their own words but unfortunately they don’t seem to remember much about the subjects. Is that normal or should I be worried they aren’t learning anything? I let the kids look at books—write what they learn by study. 🙂 Your kids sound normal to me! Nice to meet you, Tricia! I have been an “unofficial” notebooker for a while. Meaning we haven’t done it on a regular basis, or with much purpose other than to have a break from the norm. But this has encouraged me to be more regular with it! Was wondering, I saw your initial post with your daughters pic w/ her notebook. I was wondering if you ever posted what questions/info you put on the cover page? I know a bunch of people were asking for it. Thanks!! 🙂 You’re welcome! Let me know how it goes this year. I’ll post those questions, I just need to remember, haha! Thank you for writing about this subject!! I really appreciate it!! One question: At what age do you start your children with notebooking? I tried to do it with my kindergarten boy last year, and, well, it was like pulling teeth. He didn’t want to pick a subject, didn’t want to write, had to be prompted through every single sentence, didn’t want to illustrate, etc. This year, for first grade, I gave up and am just having him do copywork (I pick a sentence from a book we’re reading and dot it out for him to trace and then illustrate). Was I trying too soon, or did I just not persevere long enough? I feel like I’ve caught more vision from your article and the MP3’s of your talks from Teach Them Diligently! I really want to notebook since we need to do something more fun together and I think it will help them remember what we’re learning. We are a large family with 6 kids (11yrs-twin 4 yr. olds) so time to do this will be hard as well as challenging when you have 6 kids all talking at the same time. Is everyone doing this at the same time at the table? Doesn’t it get chaotic? I’m going to try this…with God’s blessing first, of course! Thanks for all that you do! Hi. I googled and connected to your website for Notebooking ideas, as I didn’t quite understand the purpose of the notebooking method; was it for storaging the seatwork and etc papers or for giving the child the opportunity to be a independent learner by having their notebook filled with the “work for the day” stuff and they would go for it themselves…I am seeing, from your blog, that its really not for either purpose. I am likening it to a journal or diary of what they have learned, in their own words…and that appeals to me a great deal as a new homeschool family of one mind-of-Christ 7 year old girl. I do have a question, on your Firmly Planted Family Devotional time tools. Are they only available in PDF, and do you have any plans of making them into paperback books, or are they already in paperback? I see the workbooks are over 100 pages and I must be frank when I say, I can’t imagine purchasing the workbook for $29 or the set for $39 and then having to print it. I am just curious as to whether or not there might be a printed copy of the material that I could consider purchasing. Thanks for your consideration. The Firmly Planted seems to be exactly what I have been looking for for my small family worship time. Hi Heidi! I just want to say THANK YOU for this wonderful idea! I’m am planning on trying it! I have been stressing so much as my kids are in middle school on their way to high school. I use a white board to set up his weekly schedule, but its hard to set him up daily. I might even suggest this to my 15 year old who is mostly on her own.